What can I do with landgrid.com? Find and understand parcel information at any level, whether you're buying or developing property, need data for research or professional purposes, or just curious who owns that lot down the street. Parcels are the shapes of individual properties that make up a land grid covering the entire United States (and most of the world). Parcels typically have characteristics like ownership, zoning, taxes, sale prices, and more. You can use this site to see who owns the world around you and how land is divided up into different shapes. We currently show 143 million parcel shapes covering where 95% of Americans live. See a map of coverage and sources here. Make beautiful parcel projects — no GIS experience required — and gain insights, fast. The Land Grid lets you color code, add, and filter data with the click of a button. Filtering helps you dive deep into the data and uncover patterns by seeing properties with different combinations of characteristics, like a certain kind of zoning and a certain size. Want to go out and photograph and document property conditions, or reach and interview residents? Our survey editor makes it easy to write your own multiple choice or open-ended survey questions, then use the Loveland Survey App (available for iOS and Android) to visit properties in the field, or add information to your map right from your computer with Desktop Surveying. Data collected in the field hits your Loveland account LIVE — no need for digitizing, downloading, or uploading results. Surveys big and small can be done by individuals, small groups, or teams of dozens, hundreds, or even thousands simultaneously. You can export the data you've added as a spreadsheet, shapefile, or KML, and it will come out combining your data with the base property information. This is a very powerful tool for doing something valuable that would otherwise typically make you want to pull your hair out. Pro accounts can also export spreadsheets of the base property information on the site at up to 50,000 rows at a time. If you need to export larger spreadsheets of data, or if you want to download the parcel shapes, see our data licensing page for unlimited nationwide spreadsheet exporting and parcel licensing. Your Loveland account and the data you put in The Land Grid are completely private and secure. You have full control over who can access the maps and data you create. Share maps and data with your team members and colleagues. If you want to publish maps, you can do that too: Loveland maps can be published on a “read only” basis, and you can embed them in webpages. Pro accounts now have access to a growing number of nationwide map layers to go along with the parcel data. You can now select not only street and aerial imagery, but maps including things like topography, flood and fire risk, land use, and more. Access US Census data, including population, demographics, income, health, education, and other information at the tract, block, city, county, state, and national levels with your Pro account. WoodsCamp is an example of an independent app and service that licenses our nationwide parcel data to analyze and serve parcels to its customers: private owners of forested land who want to better understand what they have and how it can be used and preserved. Visitors to the WoodsCamp site can easily find their parcel of property, and the WoodsCamp app calculates the tree coverage on the parcel to make recommendations about how it can be managed. See our parcel licensing page to add nationwide parcel data to your own app. With support from the JPMorgan Chase Foundation, Loveland partnered with the Western Reserve Land Conservancy to update our platform, gather data, provide our technology to government, nonprofit, and community groups, and organize property surveys across Cleveland, Cincinnati, and Columbus, Ohio. The projects conducted took various forms, from a citywide survey of Cleveland, to a vacant housing survey of Cincinnati, to neighborhood surveys in Columbus, with various groups and individuals in each city continuing to use the tools for projects big and small. History will marvel that Detroit’s most intense period of displacement and property damage happened in the 21st century through a misguided tax foreclosure and auction system that traded money in the short-term for long-lasting damage to people and property. Loveland cut against the political grain to show what is happening and how it can be changed through better outreach and better policy. Local government and organizations use data from The Land Grid and the mobile app to visit people facing foreclosure, understand their situation, connect them to the resources they need, and advocate for change. When advocates for Michigan’s Proposal 2 needed to reach Michiganders all across the state in an effort to change the political gerrymandering laws, they contacted Loveland for a canvassing solution. Approximately 1,000 canvassers used the Loveland Survey App to knock on more than 84,000 doors in a statewide campaign to inform and understand voters. The proposal passed. Grandmont Rosedale Development Corporation annually surveys properties in their service area and use this data to identify, track, and map vacant properties. They also use the Land Grid to record the property intervention performed by the Vacant Property Task Force operating in their neighborhood. Milwaukee LISC has recently signed up for an Unlimited account, and are preparing to get underway distributing group accounts to organizations throughout the city for a variety of projects. John Cruz at Rise St. Louis writes: "Loveland has helped not just Rise, but so many other organizations in St. Louis to be able to understand the context of our neighborhoods as we work on a path towards more equitable, sustainable, and inclusive development...Loveland has been a tremendous help in being able to challenge our views of our own communities and create dialog around the facts, not simply anecdotal evidence." Detroit Water and Sewage Department uses the Land Grid to keep track of which houses have received notices for late payments and other warnings. 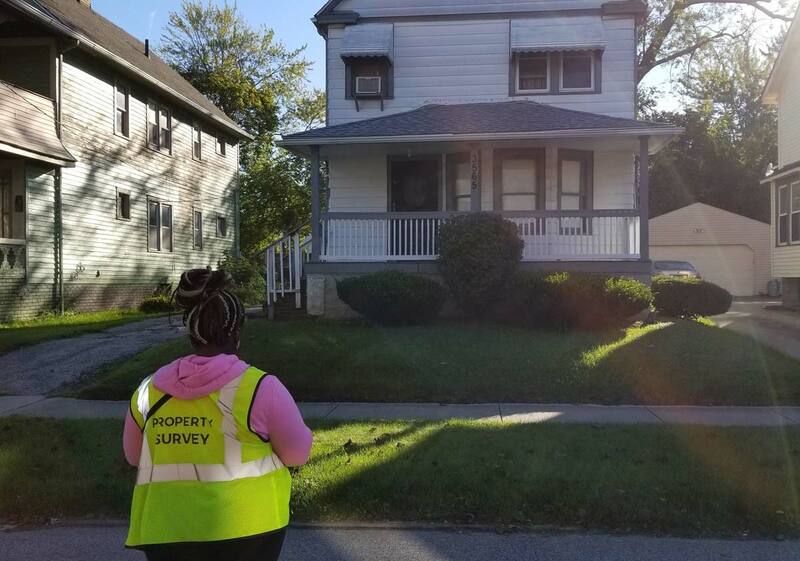 The Wayne County Treasurer used LOVELAND tools to survey foreclosed homes and collect useful data that can inform future policies and programs. The Treasurer also uses the Land Grid to help plan and implement initiatives designed to stabilize neighborhoods. The University of North Carolina at Greensboro used the Land Grid to collect occupancy and condition data for every parcel in several census blocks in North Carolina. They combined this with social, economic, and demographic data to create a market segmentation index that provides insight on how these neighborhoods could move forward. Downtown Detroit Partnership uses the Land Grid to survey properties in their service area and manage properties in their business improvement district. These tools allow them to easily collect and organize information on a large number of properties in one easy-to-use space. The Collabanooga team used the Land Grid to visualize Chattanooga's recently adopted Form-Based Code. Their the Land Grid map revealed an inconsistency in sidewalk width specification within the downtown Innovation District, and informed their suggestion to widen sidewalks within the District. The Greater Syracuse Land Bank and the Lucas County Land Bank use the Land Grid to visualize property data, and track inventory and sales. The Detroit Land Bank Authority uses the Land Grid to survey and manage all of the properties in their inventory. This data helps them determine whether the homes should be demolished or renovated. Detroit Fire Survey: LOVELAND surveyors visited, photographed, and assessed every structure-damaging fire in the city of Detroit in 2015 using the Land Grid. This data was used to identify characteristics that increased the likelihood of residential structures catching fire and then find properties in the city that fit this criteria. The Delray Community Benefits Coalition used structure and ownership data that was pre-loaded into the Land Grid to identify where publicly-owned land might be easily assembled. This information was used to determine target areas for green buffers. The Detroit Riverfront Conservancy uses the Land Grid to collect, visualize, and analyze parcel-based information. This information is shared with collaborators in an interactive map in order to operate, maintain, and develop the Detroit Riverfront and nearby green spaces. Detroit Denovo, a Detroit-based real estate company, uses the Land Grid to research and plan investments, target parcels for acquisition, and track properties they own. The Lansing Medical Cannabis Guild used the Land Grid to find properties that could become medicinal marijuana dispensaries within the restraints set by recent legislation. They imported information and created maps that spatially visualized these locations within the city of Lansing, MI.